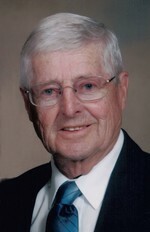 Donald Bouzane Obituary - Haileybury, Ontario | Buffam Leveille Funeral Home Ltd.
Bouzane, Donald “Don” – With sorrow the family announces the death of Mr Don Bouzane at the age of 89 years. Mr Bouzane passed away peacefully at Temiskaming Hospital, Friday, September 14, 2018 following a long illness. Born September 8, 1929 at Bishop’s Falls, Newfoundland, he was the son of the late Steven Bouzane and the late Mary Toms. Don was predeceased by his parents and his siblings: Joe, Bert, Geraldine, Catherine, Marie and Mary. Sadly missed by his loving wife Muriel [Boucher]; his son Brian [Alanna] Bouzane and daughter Kim Bouzane. Fondly remembered by grandsons Devyn and Jacob. Also survived by his in-laws: Maurice [Suzanne] Boucher and Victor [Annie] Boucher. The Bouzane family will welcome friends at the Buffam Leveille Funeral Home, Monday, September 17, 2018 from 2:00 to 4:00 and 7;00 to 9:00 as well as Tuesday, September 18, 2018 beginning at 10:00. Funeral mass will be celebrated from Holy Cross Catholic Church, Tuesday, September 18, 2018 at 11:00. Father Marcel Bruneau officiating. Interment will follow at the Haileybury Catholic Cemetery. Memorial contributions to the Haileybury Food Bank will be gratefully acknowledged.